Crystalex was a Czech National umbrella corporation created in 1974, and consisted of five branches, each of which were made up of several Czech glassworks. The branches were: Crystalex Branch Corporation, Sklarny Bohemia, Karlovarske Sklo, Cesky Kristal, and Moravske Sklarny. The Crystalex Branch Corporation was mainly composed of the glassworks that formed a previous National Corporation, Borske Sklo. These included Egermann, Exbor, Chribska, and Mstisov. 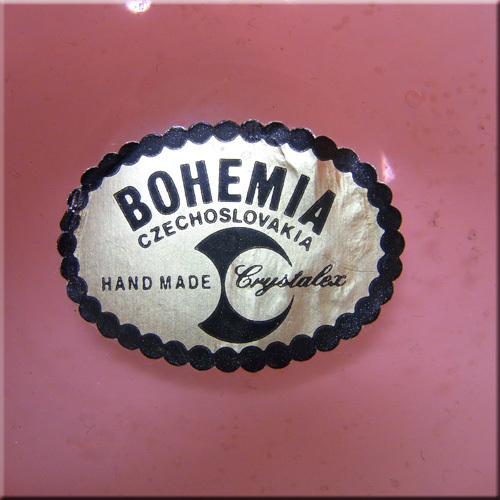 Sklarny Bohemia was originally formed in 1965 and was made up of 5 lead crystal factories. Karlovarske Sklo was the name given to Moser between 1950 - 1988. Cesky Kristal was founded by C Stolzle & Sohne in 1891, later becoming part of the Cesky Kristal National Corporation. 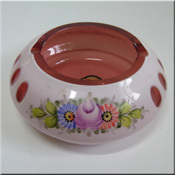 Moravske Slarny was formed in 1961 and consisted of three glassworks: Kvetna, Karolinka and Vrbno. Crystalex was privatised in 1997 and is now known as Crystalex Co. Ltd.
Crystalex/Novy Bor Czech cranberry pink + clear glass vase, 190mm tall, designed by Pavel Hlava in 1968, with generic Bohemia glass label. Crystalex/Novy Bor Czech pink + clear glass vase, 180mm tall, designed by Pavel Hlava in 1968. Crystalex/Novy Bor Czech green + clear glass bowl/ashtray, 80mm tall by 110mm diameter, designed by Pavel Hlava in 1968. Crystalex/Novy Bor Czech blue + clear glass bowl/ashtray, 80mm tall by 130mm diameter, designed by Pavel Hlava in 1968. Crystalex Czech pink glass bowl/ashtray, 45mm tall by 100mm in diameter, with white overlay, cut + painted, labelled. 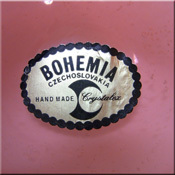 Czech pink glass wine goblet, probably by Crystalex, 130mm tall, with white overlay, cut + painted. Pair of Czech green glass vases, probably by Crystalex, 130mm tall, with white overlay, cut + painted. Czech pink glass vase, probably by Crystalex, 130mm tall, with white overlay, cut + painted. Czech green glass candlestick holder, probably by Crystalex, 280mm tall, with white overlay, cut + painted. Czech green glass miniature vase, probably by Crystalex, 45mm tall, with white overlay, cut + painted.